231 Marlborough is located on the north side of Marlborough, between Exeter and Fairfield, with 229 Marlborough to the east and 233 Marlborough to the west. 231 Marlborough was designed by architect Louis Weissbein and built ca. 1873 for building contractor George Wheatland, Jr., for speculative sale, one of four contiguous houses (225-227-229-231 Marlborough), designed as two sets of symmetrical pairs. The houses were built on two parcels of land, the western 19 feet of a 39 foot wide lot purchased by George Wheatland, Jr., from the Commonwealth of Massachusetts on May 6, 1873, and a 50 foot wide lot purchased from the Commonwealth by his father, George Wheatland, Sr., on October 20, 1874, after the houses were completed. George Wheatland, Jr., had built three houses to the east, at 7-9-11 Exeter, which were completed about the time the houses at 225-227-229-231 Marlborough were begun. Click here for an index to the deeds for 231 Marlborough. On March 11, 1876, 231 Marlborough was purchased from George Wheatland, Sr., by banker David Rice Whitney. He and his wife, Sophia Paine (Dunn) Whitney, lived at 68 Commonwealth. 231 Marlborough became the home of the Whitney’s son-in-law and daughter, Walter Burgess and Frances Elinor (Whitney) Burgess, who married in May of 1876. Walter Burgess was a sugar merchant and real estate dealer. 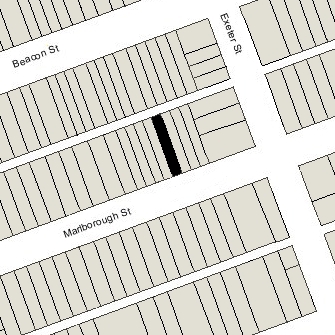 The Burgesses continued to live at 231 Marlborough during the 1882-1883 winter season, but moved thereafter and by the 1884-1885 season were living at 68 Commonwealth with David and Sophia (Dunn) Whitney. Sophia Whitney died in December of 1885, and the Burgesses subsequently divorced. Frances Whitney continued to live at 68 Commonwealth with her father. 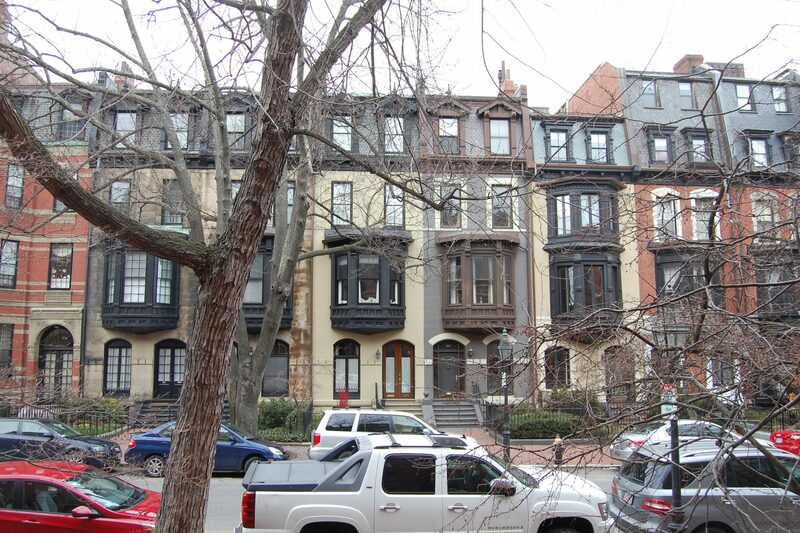 David R. Whitney continued to own 231 Marlborough and lease it to others. By the 1883-1884 winter season, 231 Marlborough was the home of Mary Morse (Barker) Taylor, widow of dry goods merchant William Oliver Taylor, who had died in April of 1881. Their children, Frederick Spaulding Taylor and Ellen (Nellie) Richardson Taylor, lived with her. They continued to live there during the 1890-1891 winter season, but moved thereafter. By the 1891-1892 winter season, it was the home of Olivia A. (Dodd) Bigelow, the widow of jeweler and bank president Abraham Orlando Bigelow. She previously had lived in Jamaica Plain. 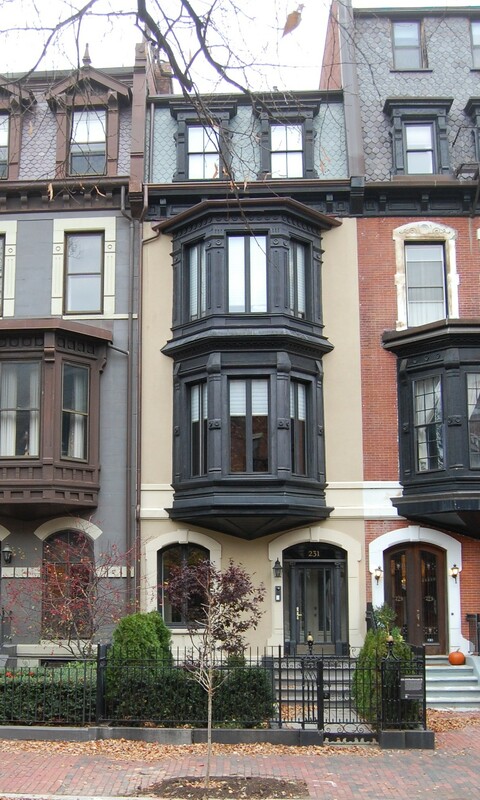 She continued to live at 231 Marlborough during the 1892-1893 season, but moved thereafter to 325 Beacon. By the 1893-1894 winter season, 231 Marlborough was the home of Miss Emily Weeks and Miss Susan C. Lougee. They operated a “young ladies’ school” at the house. They continued to live and operate the school at 231 Marlborough in 1902. By 1903, they had moved to 252 Marlborough. 231 Marlborough was not listed in the 1903 Blue Book. By the 1903-1904 winter season, 231 Marlborough was the home of Josephine Earl (Sheffield) Porter, the widow of John Addison Porter, first Dean of the Sheffield Scientific School at Yale (founded by her father, Joseph Earl Sheffield). Mrs. Porter continued to live at 231 Marlborough until shortly before her death in May of 1908. By the 1907-1908 winter season, it was the home of lawyer William Endicott Dexter and his wife, Mary Fitzhugh (Lindsay) Dexter. They previously had lived at 18 Marlborough. 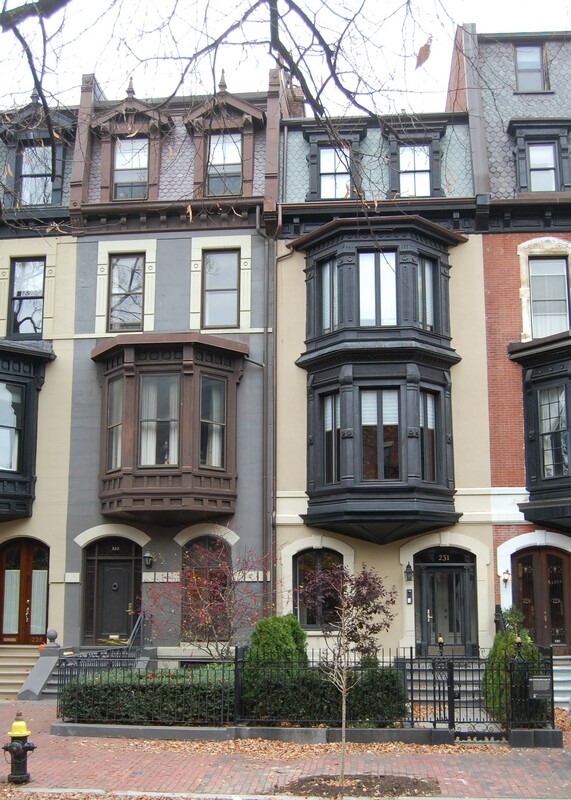 They continued to live at 231 Marlborough during the 1911-1912 season, but moved thereafter to 291 Marlborough. On October 16, 1912, David R. Whitney transferred 231 Marlborough to Frances Burgess, and the next day she transferred it to her daughter, Mabel Maria Delores Whitney (Burgess) Thomson, the wife of William deForest Thomson. The Thomsons made it their home. At the time of the 1910 US Census, they had lived on a farm in Bridgewater. He was a retired iron manufacturer and later would become an author and poet. The Thomsons continued to live at 231 Marlborough until about 1920, frequently spending their winters in Florida. On September 20, 1920, 231 Marlborough was purchased from Mabel Thomson by Gertrude B. (Hershey) Sawyer, the wife of Clifford D. Sawyer, a banker. They previously had lived at the Copley Plaza Hotel. They also maintained a home in Swampscott. During the 1929-1930 winter season, the Sawyers were living elsewhere and 231 Marlborough was the home of shoe manufacturer Henry Glenn Powning and his wife, Josephine (Stout) Soulé Powning. Their primary residence was in Manchester. By the 1930-1931 winter season, the Pownings had moved to 237 Marlborough and the Sawyers were living at 231 Marlborough once again. They continued to live there in 1934 but moved thereafter to an apartment at 180 Commonwealth. On June 28, 1934, 231 Marlborough was acquired from Gertrude Sawyer by the First National Bank of Boston. The bank held a mortgage on the property, which it cancelled in conjunction with the transaction. 231 Marlborough was not listed in the 1935 Blue Book and was shown as vacant in the 1935 City Directory. On April 15, 1935, 231 Marlborough was purchased from the bank by Grace O. (Allen) Morse, the wife of Charles Henry Bigelow Morse, a school teacher. They previously had lived at 79 Worcester. They continued to live at 231 Marlborough until about 1951. On August 30, 1951, 231 Marlborough was purchased from Grace Morse by Richard H. Kuhlke. He and Dr. James I. Roberts made it their home. Richard Kuhlke was an author and James Roberts was a physician and medical director for the New England Electric System. They previously had lived at 163 Newbury. They continued to live at 231 Marlborough in 1972. On October 1, 1973, 231 Marlborough was purchased from Richard Kuhlke by David M. Sokol and his wife, Wilma A. Sokol. On August 6, 1978, 231 Marlborough was purchased from the Sokols (by then residents of Akron, Ohio) by Leonard Kopelman and his wife, Anne Kopelman. In September of 1981, he applied for (and subsequently received) permission to construct an additional story on top of the existing garage at the rear of the building. The property subsequently changed hands, including going through foreclosure. It remained assessed as a single-family dwelling in 2016.